The week before last I took a trip to Austin, Texas. This was unfortunately in lieu of both PyCon 2006 and ETech 2006 since we couldn't get the whole Divmod team to either of those events. Sorry, disappointed conference-goers! We'll make it next year for sure. It was a half-vacation half-bizdev trip. It was really good to get a break from the day-to-day minutia of everything that needs to be done on Divmod's infrastructure, and take a look at the view from a thousand feet up, and think more about how awesome our team and technology are. Luckily we are pretty awesome so it was a good boost to my energy level to focus on that for a while. The ostensible purpose for this trip was to cement some kind of formal working relationship between Divmod and Roxor Games. On that front I think things went spectacularly. We had a series of meetings that lasted all week long, and were, I think, a credit to the very concept of a "meeting". I had hoped that this post would be longer, but looking back over the week, it seems that most of the details of those meetings involved deals that aren't final yet and are technically secret. I'm kind of out of practice at keeping secrets, having been on the open-source circuit for so long, but even I am pretty clear that putting things on a syndicated blog that gets tens of thousands of hits per post is not exactly in the spirit of an NDA. If you know me, or you know J---- (the malign overlord of Roxor), you can probably guess at least part of what's going on. Don't spoil it for everyone, please! If you, for example, posted "Oh snap are you guys making a [REDACTED] for the [REDACTED] market???" in the comments here, I think I might be violating confidentiality agreements by proxy. If you're not one of the folks In The Know, I will give you one hint: Divmod's technology has certain applications outside of email. To give you some of the flavor of the week, though, here is a cell-phone snapshot of the one formal presentation I gave while I was out there. 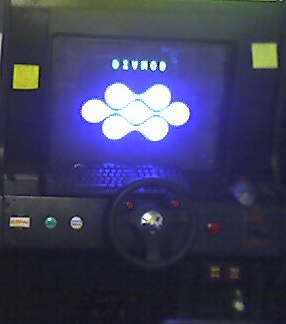 For a "projector", I used a prototype of an racing arcade machine Roxor will be releasing soon. It was also surreal, not to mention a ton of fun, to get a whirlwind tour of the gaming industry rumor mill, not having been involved for a while myself. At various points throughout the week I found myself, a visitor from two thousand miles away, relaying messages between folks who are within a stone's throw of each other. Thank you to everyone who had a great story for me. Most of all it was fantastic to get to visit a bunch of old friends. Shout outs to my homies: thanks for making time for me! Thank you Allen for driving me around town for a week. Thanks also to Jason, John, Al, Travis, Brian, Jason, Matt, Melanie, Seneca, Dave, Damion, and Sean. To those of you who I missed - especially Andy, Skiv, Adam, and Spencer, and of course anyone who I forgot to list - sorry about that. I'll be down again sometime soon, drop me a line at glyph@divmod.com and I'll make sure to meet up with you next time.